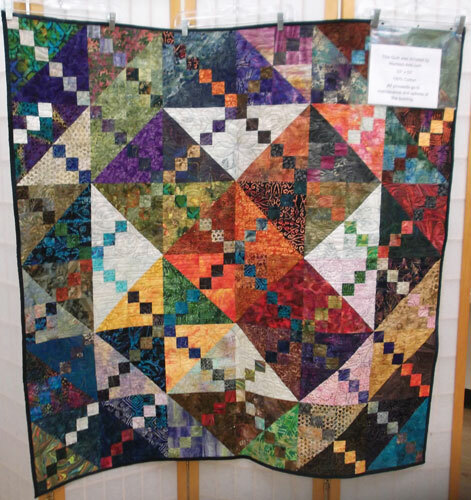 If you have not had the chance to our 2014 Raffle Quilt. It is a Scrappy Quilt that includes Batiks and Hand Marbled fabrics, it is 100% Cotton. Raffle tickets are $1.00 and can be purchased a events sponsored by the Friends of the North Fork Community Library. The winning ticket will be drawn the last day of our Labor Day Book Sale. All Funds will go towards the maintenance and upkeep of the North Fork Community Library building. This entry was posted in Library Fund Raising and tagged Library Fund Faising, raffle quilt. Bookmark the permalink.